We continue with our small groups as we discover what it means to have Amazing Boldness in this 4 part Series. Pick up your study book at 9:30am at the MP Room. We will then enter in a time of worship and watch our first DVD Teaching. After the DVD we will break into small groups. If you were part of our 50 Days in the Spirit, please remain with your leader for the BOLD Series. 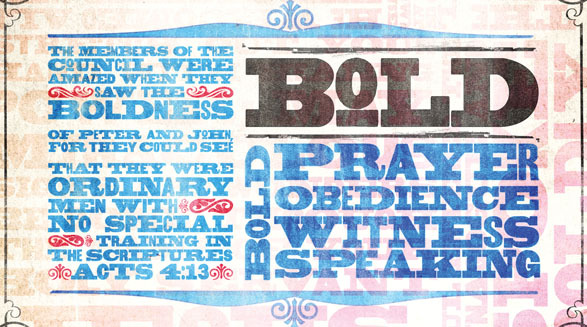 If you are joining us for our BOLD series for the first time, fantastic!! We will help connect you with a small group. If anyone would like to bring SNACKS this Wednesday that would be awesome! We will get a new sign up sheet out this Wednesday.